LIP INK® International is an American cosmetic technology company, self-manufacturing in the USA over 750 intellectual property cosmetic products and it is the holds the record to be the first cosmetic e-commerce cosmetic web site LIP INK INTERNATIONAL established in 1995. headquartered in El Segundo, California LIP INK® International, self manufactures, and sells wax-free smear-proof color cosmetics. Having reinvented cosmetics with the first wax-free alternative to traditional lipstick, LIP INK holds multiple international patents for its 100% smear-proof color technology. The company was founded on January 1, 1995, by Inventor, Mother, and "Lip Diva" Rose Nichols in 1995. Lip Ink’s International’s revolutionary concept began with Rose’s senior thesis project in Merchandise Marketing at FIDM-LA. (Fashion Institute of Design and Merchandising) It has since grown into a multi-million dollar international enterprise. Rose set out to invent an extraordinary Wax Free, Semi-Permanent Liquid Lip Color because she was tired of her old fashioned lip color coming off on her teeth, clothes, coffee cups, and food. Rose wanted lip color ink that would stay on until she was ready to take it off. She wanted the staying power of ink, without being ink. Lip Ink's website is useful with videos showing the 3 product application process. View the Sample Kit Colors, Step by Step instructions for applying and removing color, Special offers and discounts, view over 1 million colors to find the perfect one, and read comments from customers. Click here to view Gentlemen Cosmetics, Urban Cosmetic Color for your healthy sustainable lifestyle. Color Cosmetics for Men, that are 100% Smear-proof and waterproof. Cosmetic line includes Lip Stain, Eye Liner, Brow Beard and Mustache color, lip care products, fragrance, body care, hair care products, that are Natural, Vegan, Kosher, Wax Free, Gluten Free and Organic. Click here to view Dermaliquid Natural skin care for your healthy sustainable lifestyle. Personal care products for men, women, children and pets that are Natural, Vegan, Kosher, Wax Free, Alcohol Free, Gluten Free, & Organic. Click here to view Steampunk Lip Color Cosmetics, created for your individual artisan lifestyle. Women and Men can be as playful and creative as they like with this bohemian, festival, time traveler, gypsy cosmetic color line. All products are healthy sustainable. Color Lip Stain is 100% Smear-proof and waterproof . Cosmetic line includes, Lip Stain, lip care products, fragrance, that are Natural, Vegan, Kosher, Wax Free, Gluten Free and Organic. Click here to view Diet Jewelry, delivered in the form of a diet necklace, has been designed to empower our truest holistic essence, through the practice and techniques of Metaphysics, Eastern Medicine, ancient historical practices and all that we know about the human body. Healthy natural weight loss is attainable with our thoughts, deeds and practices. You are actually creating your own personalized healthy diet program. Our diet plan leads you through a healthy diet with you designing your own diet program and weight management, using simple techniques that take you beyond diet and trend diet even one day diets or one week diets to become the new you through intention, visualization and Abracadabra: As I speak I create. Click here to view Lip Ink International Lip Stain Liquid Lip Color Technology.Consisting of 3 Products. 2 Minutes, 100% Smear-proof Liquid Lip kits bringing empowerment to support your healthy sustainable lifestyle suiting every ethnicity and orientation. Bringing exceptional color for exceptional people. Click here to view Support 24/7 Liquid Lipstick for your healthy sustainable lifestyle using natural, organic, vegan and kosher botanical ingredients all included into a hand crafted three product 100% smear-proof liquid lip kit. Click here to view Members Only is an innovative approach to displaying testers across the nation allowing our already loyal clients, and new customers to test drive and pick their preferred colors, and test out new blends of color layers. Click here to view LIP INK's Miracle Brow Stain, our natural, organic, vegan, kosher, and 100 % Smear-Proof brow stain. Our 100% Waterproof Organic Brunette Miracle Brow Stain is perfect for those who want to add a brown shade of color to their brows. Click here to view LIP INK's Free LIP INK website to upgrade your long lasting lipstick to our 100% Smear-Proof Liquid Lipstick for free! You are being personally invited to take the challenge & test drive their guaranteed smear-proof lipstick. LIP-INK® Lip Color comes with a Remover because it really does, take a remover to take it off. That's our Smear-Proof Guarantee. 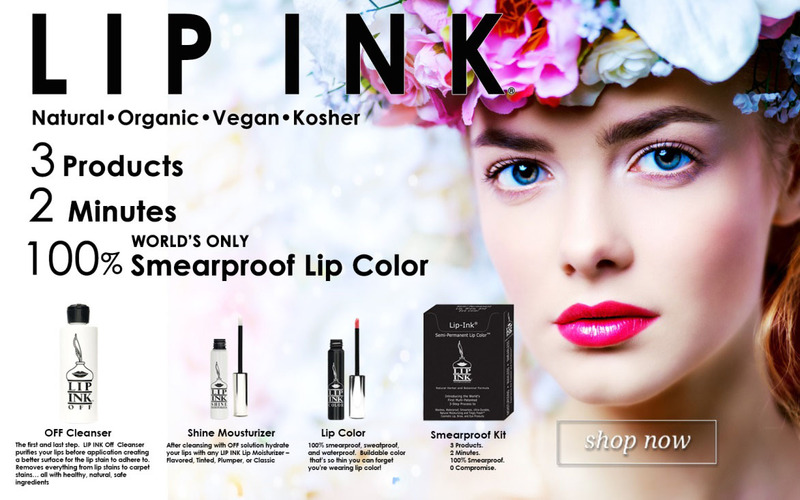 LIP INK has fundamental beliefs, ethics, and intentions are to make decisions and products that are safe, natural, healthy, recyclable, organic, kosher and renewable resource solutions that support our lifestyles of health and sustainability (LOHAS: Lifestyles of Health and sustainability) 24/7 for and eco-friendly world. 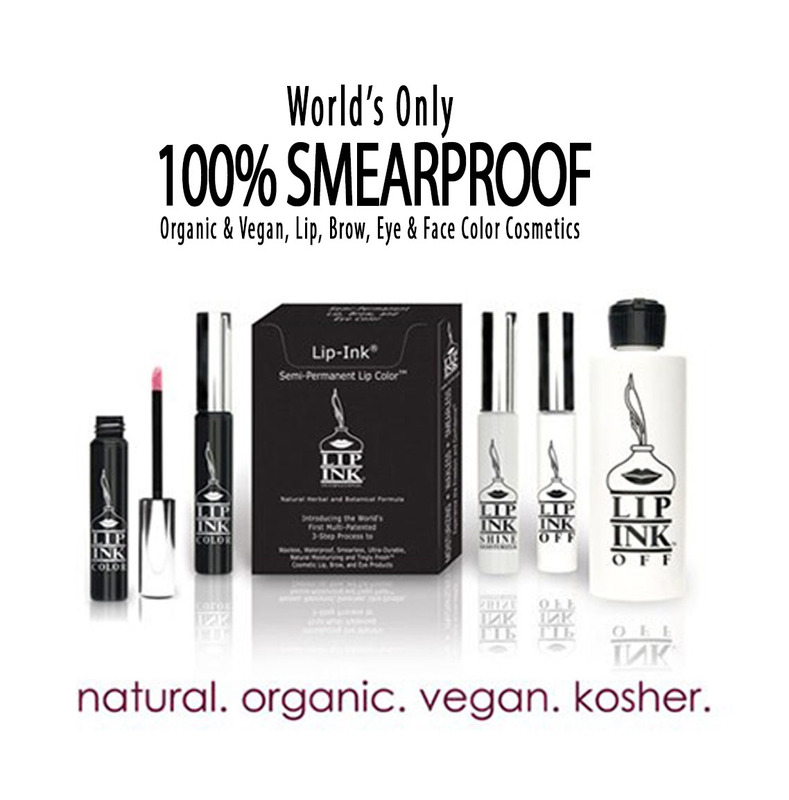 Lip Ink self manufactures organic, vegan, kosher, 100% smear-proof and semi-permanent cosmetics. Technology LIP INK® Color Cosmetics are based on scientific research and are protected by US and International patents. Competitive products cannot legally duplicate LIP INK® Color Cosmetics and their precise chemistry.